What Does a U.S. Army 88M Motor Transport Operator Do? Motor transport operators in the Army do what the job title suggests: they operate wheeled vehicles (so, cars and trucks but not tanks or planes) to transport Army cargo and personnel. It may not be the most high-adrenaline or high-profile job in the armed services, but motor transport operators play a key role in keeping the Army moving and getting things from Point A to Point B both on and off the battlefield. This important job is categorized as military operational specialty (MOS) 88M. There's a long list of duties for Army motor transport operators. In addition to operating all wheel vehicles and equipment over all different types of terrain, they manage the loading and unloading of personnel and cargo being transported, whether in a vehicle or via a trailer. 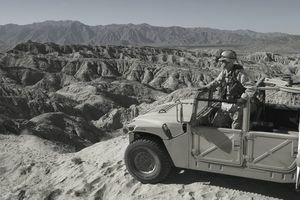 These soldiers are tasked with using defense techniques to protect convoys, and managing and correcting any malfunctions or problems with vehicles. They prep vehicles for movement, such as readying a Jeep being transported via cargo plane or ship. And Army motor transport operators oversee the safety of not only their vehicles but their cargo and passengers as well. It's up to them to make sure any transport operations go smoothly from start to finish. Soldiers in this MOS take the requisite ten weeks of Basic Combat Training and seven weeks of Advanced Individual Training (AIT). These soldiers divide their training between the classroom and real-world simulation, like most MOS training regimens. For this job, soldiers will spend more than 200 training hours driving vehicles in field training environments. To qualify for MOS 88M, you’ll need to score an 85 in the operators and food (OF) aptitude area of the Armed Services Vocational Aptitude Battery (ASVAB) test. There's no Department of Defense security clearance required for this position, but you must be free of colorblindness and have a valid state driver's license that won't expire before you complete your AIT. While the Army will provide all the training, you'll need to succeed in this role, having experience in driver education and an interest in driving and vehicle mechanics will serve you well in your training and beyond. The skills you learn as an Army motor transport operator prepare you for numerous post-military careers, including positions with trucking, moving or bus companies, or with businesses that have their own delivery fleets. You'll be able to consider a future as a tractor-trailer truck, tank truck, and heavy truck or bus driver.